What Are You Banking On? I got an email from my bank yesterday morning. I don’t want to mention their name specifically, other than to say that it kind of rhymes with Bank of America. Thank you for allowing us to be a part of your everyday. As the new year begins, we’d like to thank you for being a Bank of America® client and reinforce our commitment to connecting you to products, guidance and services that help make your financial life better. Let’s make this year the best year. 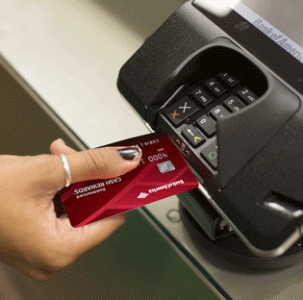 It included a photo of a hand inserting a bank card into a machine (see image). The message was perfectly, completely, 100% fine. And … it had zero impact on my view of the bank, in either direction. It was an email incarnation of “Have a nice day.” Appropriate, inoffensive, and conspicuously unremarkable. So what should the bank have done instead? They are constrained by the number of people in the room. Should we write “… part of your everyday,” or just “… part of your day”? Should we call these people “clients” or “customers”? When the meeting ends, the final draft inevitably emerges as compromised, middle of the road, blah blah. Too many cooks in the kitchen. They are constrained by the breadth of their audience. A bank needs to appeal to everyone. It operates everywhere; it offers a complete array of financial services; its target market is Planet Earth. Taken together, this means that when they write an email, or build a web site, or develop an ad, or give a presentation, they must drive straight down the middle of the road. Even the name of their business – Bank of America – is pretty much a white stripe on the white wall of company names (I guess “Acme Bank” was already taken). We are not similarly limited. We can (and should) tap the power of the niche, speaking directly to whatever narrow audience we’ve chosen to serve. We have the freedom to be specific, saying things like, “As solo professionals…” (if that’s your audience) when we write. Does that turn off the people outside our area of focus? Often. But it’s sticky marketing magic to those within it. They are constrained by fear. When you work for a highly visible, name brand company, and your job is to publish information out in the world, you know that big mistakes can be fatal (just ask the [former] marketing folks at Dove soap). In that environment, it doesn’t take long before life is about playing defense, rather than offense. Can you and I make big blunders too? Definitely. But the spotlight is nowhere near as bright – there’s freedom in that too. Bad words/decisions by the solo almost always result in anonymity, not disgrace. Here’s the bottom line. I don’t blame the people at Bank of America or any other large company for their exceptionally unexceptional emails; they have no other options. You and I, though, we can do whatever we want. And while there are plenty of things you can learn from a huge company, how to connect with other humans is not one of them. Could you spell “hippopotamus” without looking it up? What’s your favorite example of large company constraints? 3. I often observe in larger organizations what is known as the highest paid persons opinion (HIPPO) effect. Marketing research says green. Data analytics says green. Consumer surveys say green. Operations/production says green. In the end, when presented to the highest level of final approval (highest paid person in the room), that individual says blue because it’s his/her old high school football team color. Guess what? Suddenly, everyone agrees blue is best. That’s a great description of what happens, David! You are bringing back some big company memories. I am on hold with Bank of America right now…after all sorts of nonsense just for the privilege of waiting for a real person to talk to about a simple thing they screwed up on. So all I can say is “yes.” Except for the hippopotamus thing. To that I say no. Michael Katz is THE BEST! Alisa! Tell them you know me. Maybe they will send you a free thumb ring. By the way, I’m in the process of moving over to Ally bank. Wow, so much better. In a quick search through my brain-pan, I didn’t notice any large companies with ad constraints. When I think of big companies I think of Budweiser, especially during the NFL play-offs. Budweiser is not constrained much. Next up were the Auto manufacturers, but they are fairly unconstrained as well. I guess I can’t remember the boring constrained ones… maybe Ace Hardware? Regardless of what I know or don’t know I think you are on to something and do present an interesting point. Is Your Ice Too Nice? Copyright © 1999-2019 Blue Penguin Development. All rights reserved. No penguins were harmed in the production of this web site.